There are many misconceptions about international aid and its effectiveness in empowering local communities and boosting local economies. This page is designed to help you understand the myths, the facts, and why Arrive's aid, done with diligence and integrity, truly works to alleviate poverty in some of the poorest areas in our world today. Since it is our overall goal to not only help build strong communities in the third world areas in which we work but to also educate people all over the globe, Arrive has created this information source for people to use as a means of learning about the political, financial, developmental and health issues that surround the East African region, and as a platform for one to continue his or her own research. We also hope to communicate much of the clear and factual evidence that we use in order to shape and execute our goals. To read a full description of Kenya's current social-economic situation, please click on this PDF (also linked below). The file, written completely by Arrive founder Brian Ash, contains a background history of Kenya, the Nyanza Province (where Arrive does most of its work), and the Gusii tribe (the tribal area in which Arrive has set up its orphanage). The file references credible sources and talks about history as well as current economic factors such as imports, exports, and Gross Domestic Product. It talks about geography, the movement of people, and cultures throughout time. It talks about political history and unrest within the country and greater region. An excerpt from the PDF about the Nyanza Province; in which both the Keumbu Rehema Childrens Home and Light Home of Hope are, reads: "The Nyanza Province is one of eight of Kenya's administrative provinces. It lies in the southwest corner of the country. The province is inhabited mostly by the Luo tribe, but also contains the Kisii/Gusii people, the Kuria people, and the Luhya people....The Nyanza Province is one of the poorest in Kenya, with 63% of the population living on less than $1 per day. The province has the highest HIV prevalence rate in Kenya (14%) and also has the lowest life expectancies in the country (43 for women, 37 for men). The Nyanza Province also has the highest rates of malaria contraction and malarial death...[it] has the highest rate of female genitalia mutilation (FGM), although that rate has been decreasing. The Nyanza Province also has the highest rates of children under five mortality rate (206 deaths per 1,000 live births). A child born in the Nyanza Province is four times more likely to die before celebrating his or her fifth birthday than a child born in the Central Province (where Nairobi is located). The Nyanza Province also has the high infant mortality rates in the country (133 deaths per 1,000 live births)." Arrive combats these challenges in a variety of ways. Our goal is to help children from all of Kenya's 42 tribes - we've supported children from the Luo, Kisii, Kuria, Maasai, Kalenjin, Luyha, Kikuyu, and Giriama tribes. This shows not only the children but the people of the region that people of different tribes can in fact live in peace with each other. Arrive treats all of the children of the home with malaria medication in the case a child falls ill and even gives out malaria medication to other members of the village who cannot afford it and are in danger of death. Arrive firmly believes that the only way to escape extreme poverty is through education, but that topic is touched on later on in this page. A map showing population density of Kisii County; the childrens home in Keumbu is located between Kisii and Keroka. One of the only reliable documents released regarding Kisii County, which can be found here, reveals shocking and terrifying data. Among the report: "89% of HIV-positive pregnant women in Kisii County do not deliver in a health facility," "86% of children living with HIV in Kisii County in need of antiretroviral therapy (ART) are not under treatment," and "Only 22% of poor households with orphans are beneficiaries of a cash transfer program" to name a few. For more information on the HIV/AIDS epidemic in Kisii County, visit the original report. When HIV/AIDS effects a person, that person's entire family is affected. Medicine is bought instead of food; young children get pulled out of school to look for work; sources of income become insufficient or nonexistent. Arrive promotes proper health education to help overcome problems which could be avoided or reduced, for example the transfer of HIV/AIDS from mother to child during birth. Many children are forced to the streets because of the prevalence of HIV/AIDS in the Kisii County area, and these are the children Arrive works closest with. According to the article referenced below, there are many factors holding developing countries back. While Kenya is not a landlocked country, bad governance is major issue restricting Kenya from moving forward. According to Transparency International (www.transparency.org), Kenya is the 136th most corrupt country out of 177 total nations. Conflict is a major problem in Kenya, especially within the country itself. Tribal violence leads to the slaughtering of families, which in turn leads to an increased number of helpless orphans and street children. These tribal battles are usually over land, political representation, or natural resources. Conflicts over natural resources have ravished the nation, and outside agents such as Al-Shabaab are a real threat within Kenya. Like many other developing nations, Kenya suffers from the "resource curse," meaning as more natural resources are found, it only creates more corruption and poverty even though the opposite should be the outcome. For more on the resource curse, please read www.nber.org/papers/w15836. According to The Hunger Project (www.thp.org), 98% of the world’s malnourished people live in developing countries, with 214 million residing in sub-Saharan Africa. According to the Henry J. Kaiser Family Foundation (www.kff.org), 91% of all children in the world living with HIV/AIDS live in sub-Saharan Africa. All children supported by Arrive through are partner organizations are taught about HIV/AIDS, Ebola, other diseases, and how they can be contracted as well as measures to prevent transmission. They are taught Kenyan history but with an emphasis on how tribes can live together peacefully. Arrive does not cater to one tribe or one group; a united Kenya is our goal and our children see that from the moment they enter into our home. We supply our children with three nutritious meals per day to ensure their immune systems are strong and this allows them to focus on their studies. Arrive also runs a feeding program for current street children to make sure as many children are adequately fed as possible. Furthermore, as you have read above, Kenya is ranked as a very corrupt country. Aid and funds that go to the Kenyan government have little chance of reaching their originally intended causes. To effectively help people in Kenya, small, non-government organizations like Arrive deliver the most efficient support and aid without the risk of government corruption. We believe that education, literacy, and access to electricity go hand in hand. How can a student learn if they don't attend school or have access to electricity? According to The World Bank, the greatest population living without electricity is in sub-Saharan Africa; the exact location where Arrive works. We have supplied electricity not only to our home but to our neighbors and school, to enable more students the opportunity to thrive in an academic setting. 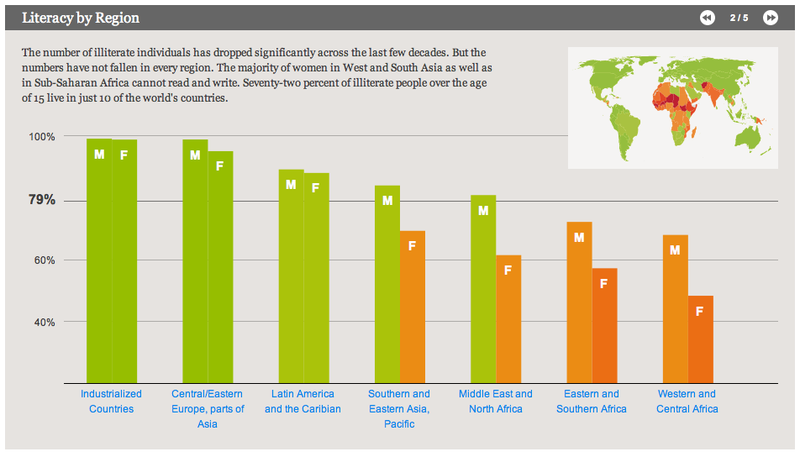 Literacy is essential, and according to Visual Data, "The majority of women in...Sub-Saharan Africa cannot read and write. Seventy-two percent of illiterate people over the age of 15 live in just 10 of the world's countries [in sub-Saharan Africa]." These statistics are staggering and show the need for better institutions and education throughout sub-Saharan Africa, as well as Kenya. When combating illiteracy, Arrive focuses on educating the children who otherwise would never go to school. Arrive supported Emmanuel Lights Academy is ranked #1 out of 53 schools in the district based on academic performance and is the only school to give free education to any orphan or street child. Learning to read, write, and have basic mathematical skills is essential if one wants to find a job outside the very competitive unskilled labor market. Education is truly the way to escape a life of poverty and every orphan, former street child, or village student of Emmanuel Lights Academy knows this and is therefore committed to their studies. In most of rural Africa as a whole, the day starts before sunrise and ends just after sundown. Electricity enables students to work on homework and academic material before or after sunrise/sunset and when the natural light from the sun is gone. International Peace Initiaves (www.ipeacei.org/index.php), a Kenyan non-profit organization, said it best: "School is a privilege that the developed world has come to consider as a right. Sometimes, even as a burden. In the developing world the chance to go to school is a gift, high school a major achievement, college an absolute dream come true." Is it possible to go from street child to Ivy League student? Read this NY Times article http://nyti.ms/1CYoU3Q and find out for yourself. At home, we provide each child with a truly balanced and healthy diet. This is especially important for children who in their former lives on the streets suffered from malnutrition. A typical dinner living on the street (if you are lucky enough to eat anything at all) is rotting, bug infested, rat scavenged food from a dumpster and lots of huffing toxic glue to dull the inevitable hunger. A typical dinner our home consists of ugali (maize flour mixed with water: an African staple food, called "pap" in South Africa, "posho" in Uganda, "fufu" in Nigeria, etc) for carbohydrates; kale picked fresh from our garden cooked with diced tomatoes, onions, and peppers (also from our garden) for fiber and vitamins A, C, and K; kidney beans for protein; and avocado hand-picked from one of our trees for potassium and heart-healthy fatty acids. Other meals throughout the day include a breakfast of fresh milk chai tea (milk coming daily from our cows) and bread; and lunch of corn, kidney beans, potatoes, and rice. Pasta, meat (chicken, beef, and goat), eggs, mandazi and chapati (East African baked pastries) are also eaten on occasion. 1.Poor Countries Are Doomed To Stay Poor. However, The Gates go on to say, "...the percentage of very poor people has dropped by more than half since 1990....That still leaves more than one billion people in extreme poverty, so it’s not time to celebrate. But it is fair to say that the world has changed so much that the terms 'developing countries' and “developed countries” have outlived their usefulness." 2. Foreign Aid Is A Big Waste. People argue that aid is a waste because America spends too much on aid. But Bill says, "Here are the actual numbers. For Norway, the most generous nation in the world, it’s less than 3 percent [spent on foreign aid]. For the United States, it’s less than 1 percent [of the total GDP]." People argue that aid is a waste because of corruption. One way to combat corruption is to take the money out of the hands of the government and let smaller non-profit organizations identify local needs and come up with viable solutions. This is exactly what Arrive does - in fact Arrive partners with a local Kenyan non-profit to truly identify the needs of the people. In this way, corruption is minimized. As Bill says, "Four of the past seven governors of Illinois have gone to prison for corruption, and to my knowledge no one has demanded that Illinois schools be shut down or its highways closed." People argue that aid is a waste because it leads to aid dependence. However, Arrive empowers local leaders of the community to work. Arrive's partner organizations are made up of a completely 100% African staff. Most projects on the ground are thought up by and carried out by local, Kenyan, community members. It is Arrive's goal that one day, they will be able to support themselves and better the community independent of outside money or aid. We believe that dreams don't work unless you do, and handouts are a waste of everyone's' time. Arrive engages in community building activities, run by local members of society, to ensure that nobody will ever become dependent on foreign aid. As Bill says, "Health aid is a phenomenal investment. When I look at how many fewer children are dying than 30 years ago, and how many people are living longer and healthier lives, I get quite optimistic about the future." 3.Saving Lives Leads to Overpopulation. This myth simply isn't true. Bill says, "When children survive in greater numbers, parents decide to have smaller families. Consider Thailand. 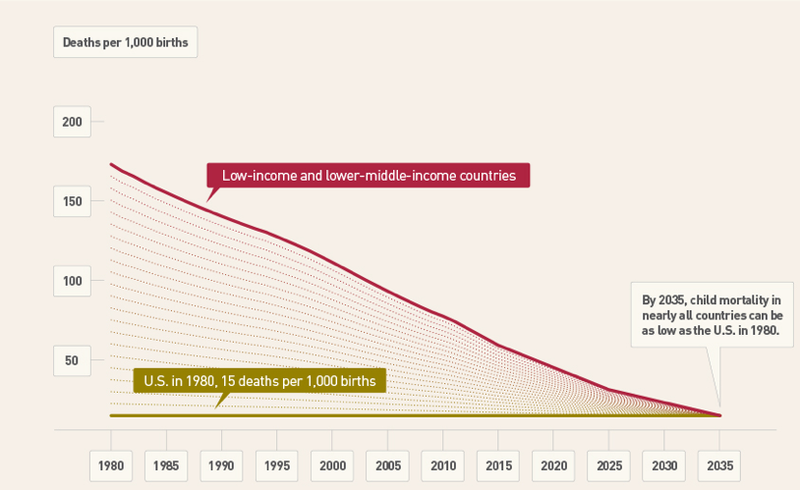 Around 1960, child mortality started going down. Then, around 1970, after the government invested in a strong family planning program, birth rates started to drop. In the course of just two decades, Thai women went from having an average of six children to an average of two. Today, child mortality in Thailand is almost as low as it is in the United States, and Thai women have an average of 1.6 children." Did you know that the average Kisii woman has nine children? And that infant mortality rates in the Nyanza Province, where Arrive works, are the highest in Kenya (133 deaths per 1,000 live births)? Arrive believes in saving lives which in turn decreases family sizes, making it more affordable and achievable to look after your children. It is as simple as that! While watching the news today it may seem like the world is spiraling downward, it is actually the opposite. Over six million children died last year, and while that is extremely sad, that is the lowest number of child deaths per year recorded in history. Now that you know the facts, what is keeping you from getting involved? By knowing what works and what doesn't, we can utilize our skills are resources to best help the most impoverished people on the planet. By engaging in effective foreign aid through non-profit organizations like Arrive, you can continue to make the world a better place for everyone. By increasing access to education, implementing better health and community services, and establishing more adequate institutions, we can empower local people to rise above the cycle of poverty. By donating to small non-government organizations, you reduce the chance of corruption, lessen the chance of wasted funds, and can be sure that the organization can more readily identify needs on a local scale. Arrive is based on the involvement of local citizens and it is them alone who have the power to make true change in their societies.